I’d seen Mmm Hmmm during its Brewery Theatre run in late 2014, so I knew what to expect. Back then, I’d promised myself that if Verity Standen ever brought this piece of genius acapella theatre back to the venue, I would make sure my (now 9 year old) daughter experienced it too. She has. With two alterations. Firstly, the Brewery is no longer being used as a working theatre and we wait eagerly for news of its replacement, a state of the art theatre space proposed for inside the Tobacco Factory proper. So, we watched this performance from the comfort of TFT’s auditorium. Tick. Secondly, this Mmm Hmmm has a different line up, Verity Standen and Ellie Showering welcoming Jannah Warlow to their eccentric fold. We’re already familiar with Warlow from her role in Adam Peck/BOV’s impressive Medusa (music composed by the very same Standen) for KS2 students last summer. With two Hmm Mmmm veterans at her side, Warlow slides in comfortably, helping transform the woes of everyday life into something beyond beauty, bemoaning the lot of Woman so that you’re extra proud to be or to know one, like she’s been there from the beginning. Tick. It’s no secret that writer, director and performer Standen has become something of a theatrical Goddess in my eyes. Her input into TFT’s The Light Princess catapulted it to the best Christmas show of the season (and, for us, possibly ever) – truly, she had us mesmerised. Standen has a way of reaching beyond expectation, of directing harmony that is so out of the ordinary that you’re not even sure you’ve heard correctly. Showering, Warlow and Standen sing with a vibrancy that twists the mundane into otherworldly, throwing in plenty of bizarre and British humour along the way. “Are you crying, Mum?” asks the kid by my side, ten minutes in. This isn’t all voice and unusual lyrics though (indeed there are some poignant, heartfelt solos). 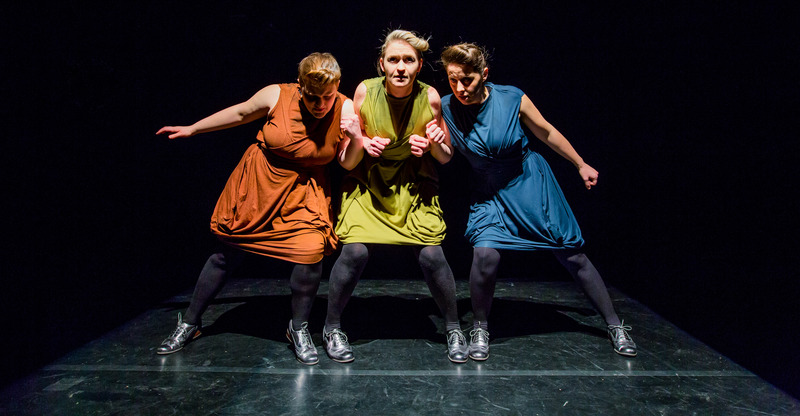 These three women have an almost uncontrollable energy, pogoing around the stage, shuffling madly for no apparent reason, bringing in more than an element of silliness. This is physical theatre for sure. At under 40 minutes long, I felt that we could have watched more, maybe until the trio were so knackered that they had to crawl off the stage like penitents, mouths seized up and dresses soaked in sweat. No? Fine! 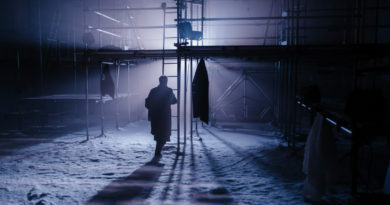 Once again, mention must be made of Harriet de Winton’s morphic costumes (we both now have dress envy) and James Mackenzie’s lighting design, both of which play an integral role in making this such an original and off-the-wall piece of theatre. After the performance, we sat at the train station turning every conversation into a song in the style of Mmm Hmmm, sharing invented-on-the-spot sentences, reading aloud platform signs with high-pitched gusto, giggling at the madness of it all. Showing at Tobacco Factory Theatre until 23rd January, Mmm Hmmm is, deservedly, practically a sell out. If you’ve got tickets, enjoy the show. If not, see you at the next tour (there will be one, won’t there? Please).